One request that we hear often is "can I change my menu buttons?". As part of the updates we are making to Reason8, we thought we would create a simple and fun way to help you to change the navigation buttons on your site. We hope you have fun and we look forward to seeing great buttons that are styled to fit with your website design. This quick knowledge paper guides you through the basics of the new "Button Builder". To start: go to STEP2 of your control panel and click the [Menu Button] link. The best way to ensure that your visitors get the most value from your UK business website is to craft a user journey using the men buttons on your website. The DotGO menu button creation tool is one of many simple tools that allow you modify and design your own business website. Either choose a button from your favourites (automatically created as you experiment ) or select one from our library of samples. Click [SELECT] and start editing your button. (Remember the style you choose at this point is just a starting point and you can completely edit and customise it). The button system uses the editing screen below and you can see how your buttons look as you make changes to them. There are 9 ways that you can change the buttons – just click the little icons and you can start making changes straight away. There are a number of features that are worth mentioning in more detail. Will all your buttons fit ? 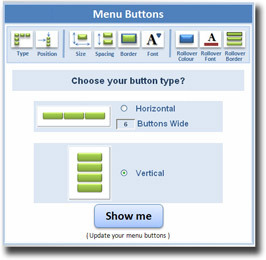 Unlike vertical buttons, you only have a limited amount of space for horizontal buttons and if you have too many buttons then they will either look too cramped or will overflow into a second row. Overflow buttons may cause unexpected results. We ask you to choose the number of buttons that you want in your menu bar. If your button text is very long then the button text will wrap and you may end up with different sized buttons that might look odd. Do they match with your website layout? Will your content change ? Horizontal buttons give your content more room to spread out. This might mean you may have to adjust the formatting to fit this extra pace. Remember to click the “Show Me“ button. None of the changes that you make will take effect until you click this button. Several customisable features use the reason8 colour picker. You can choose from more than 6million colours. Just click a colour and close the window. To use the picker click inside the colour box and a colour picker window will open. The sliding bar on the left selects the broad colour and the bigger area on the left allows you to select the exact colour you want. If you already know the special (Hex) colour sequence of the colour you want then you can simply type it into the box below the picker. (remember to prefix the number with a special ‘#’ symbol). The fast colour pallet chooser. 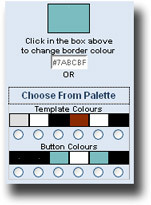 To save fiddling and make things a bit quicker, we have also included a quick palette. Just click this link and it opens up with some pre-chosen colours. We include your main website colours and any colours you have chosen while building your buttons.